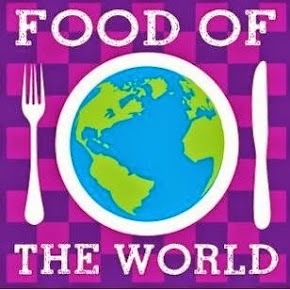 We are visiting Israel for our "Food of the World" party this month. Israeli food is a mixture of native foods and foods that Jews who have settled there brought with them. Cholent is a classic Shabbat stew that originated in Vienna, that is cooked slowly overnight so observant Jews can eat it for lunch. I was told by an Israeli friend that there are many variations on this stew. Her mother made it with turkey necks, some people use organ meat, or just bone filled with rich marrow. I looked at many recipes for Cholent. I settled on adding raw eggs, which my kids thought was kinda of interesting. There are many types of beans that are used in Cholent, so I decided just to add a mixed bean package, the kind you buy to make 9 bean soup. All the recipes included pearl barley and potatoes. There was a mixture of recipes that used beef chuck, stew cubes, or beef short ribs. I thought ribs would add more flavor because bones are great for seasoning slow cooking dishes. The result was an extremely tender piece of meat in a classic tasting gravy. The barley was an added surprise. The texture and flavor from cooking in beef broth was really impressive. The potatoes were delicious. The eggs were not very interesting, but that may have been because I didn't cook the stew long enough to get the broth to penetrate the shell. The beans didn't really add any flavor either. I think I would skip them and put in some root vegetables and greens. The key to this dish is long, long slow cooking. If I made this again I would put it on low overnight and maybe add some more broth in the morning. Overall, this was a truly satisfying stew. Prep Time: 30 minutes if you brown the meat. 1)Put a cast iron skillet on high heat. While you are waiting for it to heat up. Salt and pepper the short ribs. 2) Put potatoes and onions in the bottom of a large slow cooker. 3) Sprinkle the pearl barley and mixed beans over the potatoes and onions. 4) Sear the short ribs about 4 minutes per side until they are browned. Put them into the slow cooker. 5) Bring beef broth to a boil, either on the stove, or in a microwave. Whisk in molasses, paprika, and salt and pepper. 6) Pour the broth mixture over the beef and vegetables. 7) Cook on medium for 10 to 12 hours, or on low for 15 to 20 hours. Add more beef broth if need. Great served with rustic bread for dipping. Join us next month May 10th when we cook a recipe from New Zealand. This is a very interesting dish Diane. I'm especially intrigued by the eggs. Yes, I wish I had cooked it longer to have seen the eggs get seasoned by the beef broth, next time. I was also interested in the eggs. The stew itself sounds great, especially with the barley.